Would you like to be involved in research, clinical trials or just interested in what research is being conducted? From time to time RYC is approached by health professionals who believe our community would have valuable contributions to the outcomes of their work. Participation is voluntary and direct contact with the researcher will be necessary for you to participate. Please see the information below for further details. A four-year comparative case study. Previous research has demonstrated the quality of life, body image and other benefits of breast reconstruction for women undergoing mastectomy for breast cancer. This mixed methods project will systematically explore factors behind the low and uneven rates of breast reconstruction across Australia. ​Women who have personal experience with breast cancer treatment and specifically who wanted to have breast reconstruction but have had trouble accessing breast reconstruction. 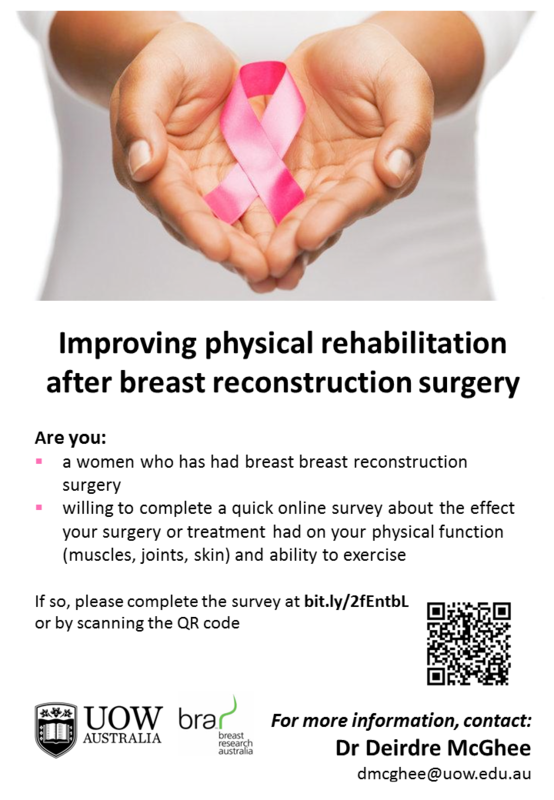 ​​Breast Research Australia based at the University of Wollongong aims to develop rehabilitation and educational resources for both patients and clinicians to improve the health and quality of life of women who have had breast reconstructive surgery. They will be developing these resources based on the results of their Australia-wide survey. any treatments, interventions or education you had to address these symptoms (how these problems were managed by the health care professionals directly associated with your surgery and post-operative care). Have had breast reconstruction surgery following a diagnosis of breast cancer. It will take approximately 15 minutes to complete and is fully confidential and anonymous. or copies of the survey can be mailed (together with a stamped return-envelope) by contacting the Chief Investigator of the study, Dr Deirdre McGhee (dmcghee@uow.edu.au); (02) 4221 4980). The University of Wollongong Human Research Ethics Committee has approved this study (2015/453). If you have any questions about the study, please contact Dr Deirdre McGhee.